August 31, 2011 – When an animal kills and eats a human, we don’t blame it for acting according to the dictates of its nature...yet we still get a heavily armed group together, chase it down, and kill it. That’s because human beings are harboring a secret. We’re damned tasty, and we don’t want that to get out in the animal world. Once a predator is in on that secret, it’ll try to take down as many of us as it can. And with all the problems in the world, we don't want to add serial killer animals to the mix. 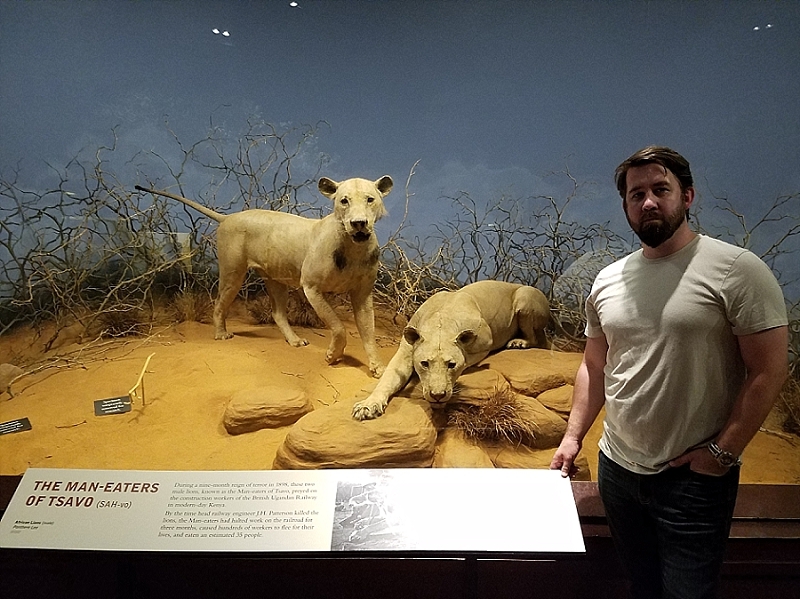 You only have to look as far as the three taxidermied serial killer lions in the Field Museum, a natural history museum in Chicago, to see that the above isn’t an overreaction. That’s right. Serial killer lions. I’m going to be using the word terrifying a lot in this article. Somehow the Windy City ended up with the stuffed carcasses of three of the most notorious multiple man-eaters on the books. 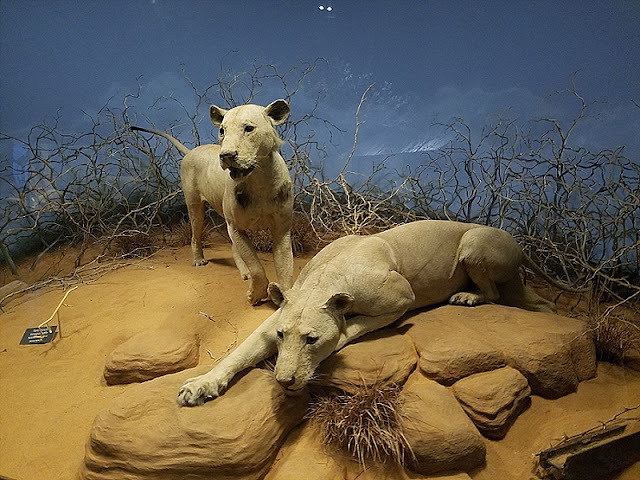 The most famous of the trinity are the Lions of Tsavo (also called the Man-Eaters of Tsavo), a pair of maneless male lions that, working together in terrifying concert, killed somewhere around 100 people in Eastern Africa in 1898 and then, in 1996, had a movie made about them starring Val Kilmer and Michael Douglas called The Ghost and the Darkness. Yup, those lions. It happened while the British East Africa Company was building the Uganda Railway, which linked Mombasa, Kenya, to Kampala, Uganda. During the construction of a bridge over the Tsavo River in Kenya, a pair of lions, each measuring almost ten feet long from tooth to tail, began picking off the railway workers. For months, the workers lived in terror, waiting for their turn to be hunted down and eaten by this feline equivalent of Henry Lee Lucas and Otis Toole. They built fences, but the lions penetrated them. They installed traps, but the lions avoided them. Finally, at the beginning of December, almost ten months after the first victim, the man in charge of the operation, a Lt. Col. John Henry Patterson, took one out with a rifle after multiple shots. Three weeks later, he got its partner in crime after a terrifying battle that ended with him up a tree and it full of ragged bullet holes. After some exploration, Patterson found a cave that he deemed to be the den of the lions due to the fact that the floor was covered with human bones, although some modern wet blankets have proffered that it might instead have been an aboriginal burial ground. Patterson later wrote a book about the entire experience, estimating the victims at somewhere around 135. Later, more wet blankets, after conducting scientific studies of the carcasses have tried to knock the number eaten (though not killed) down to a less spine-chilling number, but could only get it as low as 35. Spine still chilled. As to the lions themselves, Patterson did what any self-respecting adventurous Brit in a safari helmet would have done at the time. He turned the pair into rugs and held onto the skulls as mementos. In the 1920s, he sold the skins and skulls to the Field Museum, who restored and stuffed the skins for display, where they’ve remained to this day. You can buy plush versions of the cuddly killers in the museum gift shop. The Lions of Tsavo are located on the main floor of the museum in a glass-fronted diorama in the impressive mammals section. 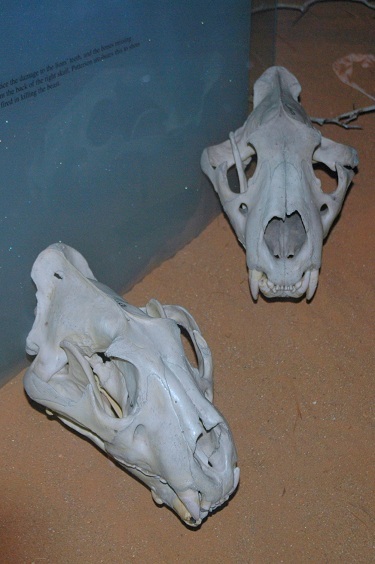 The disembodied skulls of the lions lay on the ground at their feet. 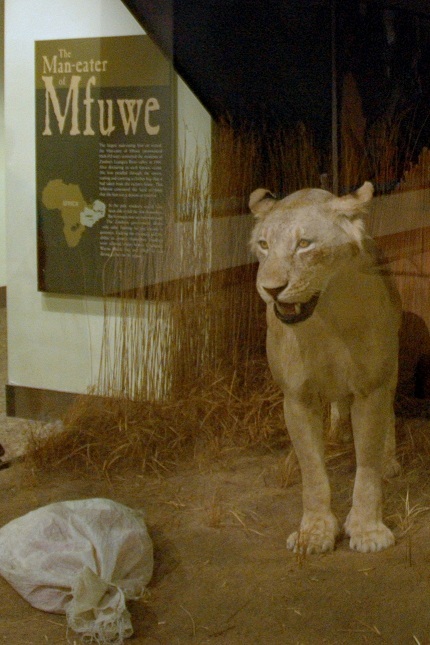 The other serial killer lion that the Field Museum boasts has been dubbed the Man-Eater of Mfuwe. This guy’s located on the bottom level of the museum, outside of the Egyptian section. Like the Lions of Tsavo, it’s also a maneless species of male lion. At 10’6” long and 5’ tall, it’s the largest man-eating lion that we [care to] know about, and even though its victim count is lower, in some ways, its story is just as terrifying. Partly, it’s because its reign of terror occurred recently, in 1991, this time in a village in Zambia, which is also in Eastern Africa. Over a two month period, the enormous beast killed at least six people in the village. Here’s the rest of the terrifying bit. After its last kill, it returned to the crime scene and grabbed a bag of clothes from the victim’s house for a souvenir. It then proceeded to walk brazenly walk down the streets of the village in broad daylight, carrying the satchel in its mouth as if lording it over the people that their lives were in his jaws. The boldness of the lion made the people think it was a supernatural creature. Truth is, the lion just knew the law. Hunting in Zambia is restricted to safaris for economic reasons, so there was nothing the residents could do but sabotage their own Yelp restaurant rating and hide in their homes, hoping the lion filled up on their neighbors before it got to them. Fortunately, it was later shot by Wayne Hosek, a safari hunter who had grown up in Chicago looking in awe at the Lions of Tsavo in the Field Museum. 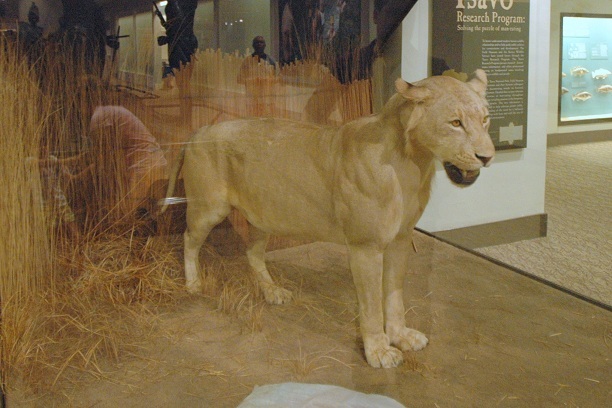 He camped out with a group for some three weeks, waiting for a glimpse of the man-eater and, after killing it, donated the beast to the museum, where they display it with a prop laundry bag. Once people find out you like serial killer lions, you’ll get them every Christmas. Since that time, the museum has funded various research expeditions in the Tsavo region to study its lions. There is apparently tons we don’t know about them. Especially the serial killer members of the species. Nobody knows why these random brutes start killing and eating humans. Tons of ideas are proffered, of course, everything from scarcity of regular food sources to the Dr. Loomis theory of “pure and simple evil,” but nobody really knows. One day, I’ll have to do an entire post on the Field Museum, which is full of some pretty cool stuff, including Sue, the most complete Tyrannosaurus rex skeleton ever found, and Bushman, a taxidermied gorilla that was one of Chicago’s most famous residents in the mid-1900s. However, I’m not sure any of it tops their three terrifying serial killers. I’m also not sure why every single Chicago team mascot isn’t a lion.